Gwinnett Place Mall is a shopping mall located in Duluth, Georgia, a suburb of Atlanta in Gwinnett County. For the first 16 years, Gwinnett Place was the leading mall in the region, drawing shoppers from as far away as South Carolina and centering what was then one of the fastest-growing counties in the nation until the openings of Mall of Georgia in Buford and Sugarloaf Mills in Lawrenceville. When it first opened in early 1984, its original anchors were Rich's, Davison's and Sears. In 1986, Mervyn's joined the mall and Davison's was changed over to Macy's. Further anchor shuffling occurred in 1995 when Parisian joined the mall and Mervyn's left the mall in 1997, respectively. JCPenney took over the Mervyn's spot the following year and closed in 2015, with Beauty Master taking over in 2016. Macy's and Rich's merged in 2003 to form Rich's-Macy's until 2005 when the name was changed to just Macy's. With two Macy's in the mall, the former Davison's closed and in 2010 reopened as the first MegaMart in the U.S. In 2007, Parisian was renamed Belk, which closed in 2013 and remains vacant to this day. 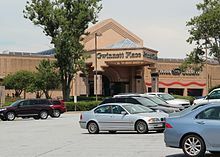 In these aspects, the mall developed on a very similar fashion as Town Center at Cobb on the northwest side of Atlanta, and were in many ways sister malls. However, one of the distinct features about Gwinnett Place Mall is the Macy's (former Rich's), which features an exterior almost entirely covered in mirrored glass. The mall was seriously challenged and hurt by the openings of Mall of Georgia in 1999 and Sugarloaf Mills in 2001 (also owned by Simon). Not only did the mall take a large part of its customer base and all of its out-of-state shoppers to these new malls, but the mall was also unable to attract any new anchors for several years although the Macy's moved its location to the defunct Rich's on the west side of the mall and Parisian became Belk. In 2008, Gwinnett Technical College opened an International Education Center there, where students enrolled at Gwinnett Technical College go to take foreign language classes, and other classes, such as general core (English, math, etc.). Recently, the Korean store Mega Mart opened a location in the former Macy's. Currently, a number of the mall's store fronts and spots in the food court are empty and for lease. The recent downturn of the mall in 2013 has led to the closure of Belk as well as owner and manager Simon Property Group to lose the mall to foreclosure where it was acquired by retail rehab specialist, Moonbeam Capital Investments LLC. JCPenney closed April 4, 2015 and Beauty Master, the regional beauty department store purchased the former JCPenney building in March 2016. The former Belk is expected to have some redevelopment but may close by 2020. In December 2017 the body of a 19-year-old woman was found in the back room of the food court, where it went unnoticed for weeks. The mall has also had ongoing issues with homelessness, gangs, and prostitution in and around the mall and surrounding areas. On May 31, 2018, Sears announced that their location here would be closing in September 2018 as part of a plan to close 63 stores across the United States. In late February 2019, The Atlanta Journal-Constitution and Gwinnett Daily Post reported that sports developer CricRealty intends to redevelop the Gwinnett Place Mall site to build a mixed-use development anchored by a 20,000-seat cricket stadium. On July 16, 2018, streaming service Netflix released a teaser for the upcoming third season of its hit series Stranger Things. The ad was made in the style of a 1985 mall advertisement for the fictional "Starcourt Mall". In reality, the crew of Stranger Things did a cosmetic restoration of a portion of the Gwinnett Place Mall, returning authentic signage and storefronts to the mall to represent many businesses that have since ceased to exist. The transformation took place during May 2018, with production of the series taking place in the mall during the subsequent summer months. ^ Matt Kempner, The Atlanta Journal-Constitution. "Kempner: Body unnoticed in Atlanta area mall for weeks? A mall fades". myajc. ^ Smith, Aaron (31 May 2018). "Is your Sears or Kmart closing? Check the list". CNNMoney. ^ Coyne, Amanda C.; Becca J. G. Godwin, The Atlanta Journal-Constitution. "Sears closing 3 'non-profitable' metro Atlanta stores". ajc. ^ Estep, Tyler (February 26, 2019). "Gwinnett Place Mall might be sold — and become a cricket stadium?". The Atlanta Journal-Constitution. Retrieved April 5, 2019. ^ Yeomans, Curt (February 26, 2019). "Media report: Gwinnett Place Mall may be sold, converted to cricket stadium". Gwinnett Daily Post. Retrieved April 5, 2019. ^ Ho, Rodney (May 11, 2018). "Gwinnett Place Mall goes back to the future for 'Stranger Things'". Atlanta Journal-Constitution. Retrieved July 16, 2018.